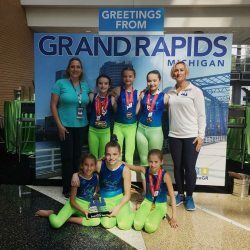 The Level 3 Team representing C3 Gymnastics, Sinking Spring, Pa. took second place in the State Games of America held in Grand Rapids, Mich. on August 3-6. Eight C3 gymnasts competed in the event, with six earning individual medals and two winning all-around medals. Nearly 13,000 athletes representing 50 states and Canada competed at the Games, including over 500 from Pennsylvania.